One of my favorite recent TV commercials is the one where the office worker gets mad that he wasn’t asked to join his colleagues for an impromptu “taco party” in the hall, until he realizes that his invitation came late because of his lousy cell phone data plan. I must’ve seen this commercial about four or five dozen times, and I’m not yet tired of it. The dialogue is rich; I love the way our aggrieved protagonist sidles up to the rolling cart full of Mexican food and says, “Hey, everyone’s eating tacos outside Bill’s office. Don’t you think that’s some information I would’ve liked to know? I like tacos.” The performance by the lead actor is terrific too, as he comes in with a fake smile and then gets more righteously indignant while he unloads on an invited co-worker who gives people “the creeps.” Then our man’s phone buzzes, and he realizes he made a mistake, which he tries to smooth over with a wan smile and an, “Oh, yeah… hey.” The ad is edited well, catching everyone’s stunned reaction as their cubicle-mate goes from chummy to mean; and even the smallest details are right in place, such as the way the outraged hero carries a plastic-encased vending-machine sandwich in his hand throughout the entire spot. When I watch “Taco Party” though, I can’t help but think about how much talent and effort went into something so fleeting. That’s not meant to be an insult; all things being equal, it’s better that the people behind TV ads try to make something great than not try at all. Still: It’s just a commercial. “Great” isn’t really a possibility, is it? If I hesitate to dismiss that idea of a great commercial, it might be because I’ve spent a lot of time lately listening to the Phil Spector Presents The Philles Album Collection box set, which Sony Legacy released last week. 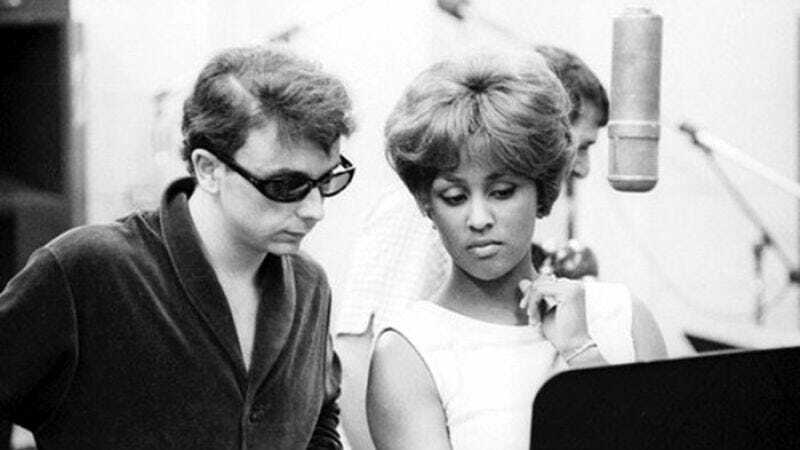 Philles was the label that boy-wonder producer/songwriter Phil Spector formed in 1961 with Lester Sill, and through which he put out some of the singles that cemented his legend as a pop genius: The Crystals’ “Da Doo Ron Ron,” The Ronettes’ “Be My Baby,” The Righteous Brothers’ “You’ve Lost That Lovin’ Feelin’,” Ike & Tina Turner’s “River Deep—Mountain High,” and more. It wasn’t always a smooth ride for Spector, and he didn’t always get his due. He’s probably most often thought of now as the frizzy-haired kook who was convicted and imprisoned for shooting and killing his date, actress Lana Clarkson, in a bizarre 2003 incident. But Spector was an odd bird even in his early days as 21-year-old producer, turning Brill Building product into hits. He wore his hair long and dressed with flair long before it became fashionable to do so, and made it difficult for the old guard in the music business to take him seriously. After Spector went independent and knocked out million-selling 45s seemingly every month, the industry still treated him as though he were living on borrowed time. Cultural commentators mocked him—David Susskind once read the lyrics to “Da Doo Ron Ron” on TV as proof of the idiocy of rock ’n’ roll—and DJs held him in contempt for the ways he tried to outmaneuver them. Spector would stick jammy jazz instrumentals on the B-sides of his singles so that DJs would be forced to play the A-sides, and he deliberately listed an incorrect running time on the label of the “You’ve Lost That Lovin’ Feelin’” 45, so that DJs wouldn’t balk at playing a song that was nearly four minutes long. Eventually, Spector’s eccentricity and obstinacy caught up with him. As rock ’n’ roll grew both wilder and more technically elaborate, Spector stuck with his defiantly mono “wall of sound,” layering instruments on top of instruments and turning every single into an epic. The song he considered his masterpiece, “River Deep—Mountain High,” stalled on the charts in 1966, and effectively ended Spector’s Philles era. He all but disappeared from the public eye for a few years, then had a revival in the ’70s when The Beatles brought him over to London to help out on some of their solo projects, as well as to salvage something out of the tapes for what became Let It Be. The lads grew weary of Spector’s unreliability though, and Spector retreated from view again, popping up occasionally throughout the decade to helm divisive albums by Dion, Leonard Cohen, and the Ramones. There was a revival of interest in Spector when the Back To Mono box set anthology was released in 1991, but otherwise he’s been more infamous than famous in recent years. Phil Spector Presents The Philles Album Collection likely won’t change that. It’s an odd set, more for Spector die-hards and pop historians than for the unconverted. The seven-disc box contains three albums by The Crystals, one by The Ronettes, one by Bob B. Soxx & The Blue Jeans, and one singles anthology—all as they were originally released, between 1962 and ’64—plus a bonus disc of those tossed-off B-side instrumentals. Missing are the blockbuster 45s Spector produced in ’65 and ’66, like “You’ve Lost That Lovin’ Feelin’” and “River Deep—Mountain High.” Also missing is A Christmas Gift For You, the beloved Phil Spector Christmas album that’s become a perennial bestseller despite bombing on its initial release in 1963 (on the day President Kennedy was assassinated). And since Spector cared more about singles than LPs, the albums here are rife with filler and repeats. Only two songs appear on The Crystal’s He’s A Rebel that weren’t on the previous year’s Twist Uptown; and the group’s third album, Sing The Greatest Hits, repeats some of those same songs yet again, while giving over a quarter of its tracks to The Ronettes. Neophytes would be better off picking up the also-just-released The Essential Phil Spector, a two-disc, 34-track set that’s basically a leaner Back To Mono. It was such a powerful expression of the new teenage consciousness that flimsiness and naivety actually made the music more appealing, not less. … [It] sounded exactly like the people—immature, unformed, full of tentative romantic hopes and dreams—who would hear and respond. … His finest records—those shuddering epics that attracted comparisons to Richard Wagner—gave a generation of adolescents an ineradicable soundtrack to their lives. They were like Roy Lichtenstein’s renderings of frames from comic books, except that whereas Lichtenstein’s work was made to be hung in art galleries and admired by connoisseurs, Spector sold his vignettes of first kisses and first heartbreaks back to the kids who were actually experiencing them. And what the grandeur told them—yes, even “Da Doo Ron Ron”—was that their feelings had a place and a value in the world. Spector could overdo it. When “River Deep—Mountain High” failed, some DJs cited the production, which verged on overkill. Later, when Spector worked with John Lennon, the Beatle had to restrain his new producer from slapping more and more layers onto what were already very dense recordings. Spector was certainly capable of burying a song in his signature style, at which point his records lost whatever meaning they were supposed to impart. I suppose the same could be said of clever commercials. As many times as I’ve seen the “Taco Party” spot, it always takes me a moment to remember that it’s an ad for AT&T. The service being pitched is clear—it’s a faster network, so that customers don’t receive important messages too late—but who’s offering that service isn’t as emphasized. Maybe that makes “Taco Party” a bad commercial. But it does what I need it to do, which is to be diverting and clever when I’m stuck watching a live telecast and can’t fast-forward. For 30 seconds, I get to enter the space of this office, with its fragile egos and shaky relationships, all revealed through the exchange of glances while one irritated guy vents. There’s a lot of amusement there, packed into a small space. For what it is, it’s just about perfect. So sure, when the lyrics are read out loud, “Da Doo Ron Ron” sounds pretty dumb. But add the handclaps and the horns and that sucker revs like a motor that’s been tuned by a pro. No song called “Da Doo Ron Ron” could’ve been made any better. And damn it, that’s admirable.